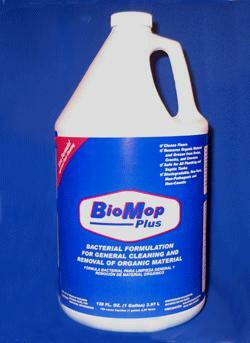 PRODUCT DESCRIPTION: BioMop Plus™ is specifically designed for cleaning restaurants and commercial kitchen floors, hard-to-access corners, and drains. Bio Mop Plus™ combines patent-pending surfactants for immediate cleaning and a proprietary blend of concentrated bioenzymatic actives for degrading the most resistant grease molecules, the long-chain fatty acids. 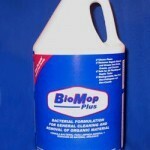 Each application of Bio Mop removes layers of embedded soil and grease. Regular use prevents food and grease waste build-up, reduces slippery floor surfaces, maintains a floor that is deep-clean and odor-free and reduces organic material buildup in drains. WHERE TO USE IT: Bio Mop is best for use in restaurant kitchens and other food-handling and commercial facilities.